I hate thumbnails! 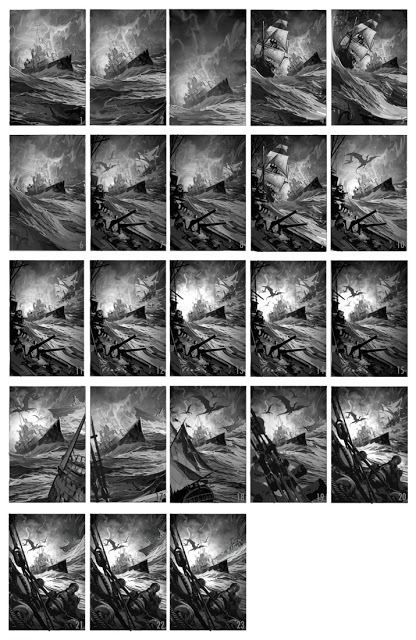 Let me rephrase that by saying, I hated thumbnails. Up until recently I have always felt my thumbnails left a lot to be desired, not only for myself but also the client. While I have never gotten a complaint as to the level they were ever at I just felt they never really showed my final intentions. I’d always be chomping at the bit to move along and get started throwing value down on the final canvas as quickly as possible. I just didn't enjoy all the preparatory work involved with creating the final image, even though I knew it all was necessary. 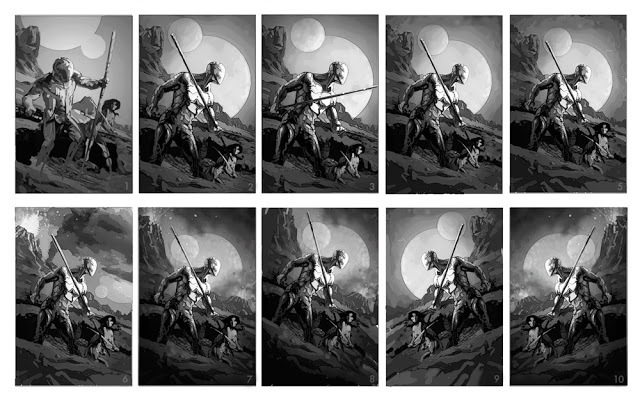 Recently I have forced myself to really push my thumbnails as far as possible, trying to create full blown miniature black and white paintings of the image I have in my mind. This has helped me immensely! Even though I spend more time on these sketches it saves time down the road at a later stage of the illustration. Everything is now figured out and there is no trial & error moving forward. I know what I am looking for in reference, what I have to do for the final drawing, and even know what’s happening value wise with the final painting. Best of all, I have really come to enjoy the thumbnail stage of a project now! Check out the thumbnails above (click to enlarge) from some recent projects and let me know what you think. Also let me know your thoughts on preparatory work. Love it or hate it? My A Princess of Mars piece was selected from over 300 entries for inclusion in the upcoming Frank Frazetta tribute exhibition at Gallery Provocateur. The Exhibition will open concurrent to the Chicago Comic Convention which runs from March 18th - 20th. Proceeds from the show will be donated to the Juvenile Diabetes Research Foundation for Frank's granddaughter Jessica, who has type 1 juvenile diabetes, in hopes for a cure. Like so many, Frazetta’s work was a tremendous inspiration for me as a young artist and continues to be to this day. More specifically Frank’s Dark Kingdom piece from above was probably the single greatest influence on me and fueled my desire to pursue illustration. Copying from my older brothers Molly Hatchet album, I would spend countless hours trying to recreate the masterpiece as a child. That original album hangs in my studio to this day. More info on the artists and exhibit can be found here, and many thanks to Veronika Kotlajic of Gallery Provocateur for putting together such a great show for such an awesome cause. I am very honored to be a part of this show. Just in time for his birthday here is a recently completed portrait of our sixteenth president, Abraham Lincoln. I have always been fascinated by Lincoln and have wanted to paint him for quite some time. Such great sunken eyes! I also thought this would be a good opportunity to show off a step by step of my painting technique. I’ve added a new section to the website called “Process” which can be accessed from the site’s main navigation bar. So if you've been curious as to how I go about a typical painting click here and check out the step by step process and video slideshow.